Notes: Southport Ash Street was situated on the West Lancashire Railway (WLR) Company’s Southport & Preston Railway which opened in stages between 19 February 1878 and 6 September 1882. The WLR was promoted by Sir Thomas George Fermor-Hesketh, Bart. Royal Assent was given for the ‘West Lancashire Railway’ on 14 August 1871. The Act authorised construction capital amounting to £150,000. James Brunlees and Charles Douglas Fox were appointed as civil engineers, and the contract for construction was let to Clarke Pruchard and Co. The first sod was cut on 18 April 1873 at a special ceremony held at Little London, in Southport, attended by the Mayor, Alderman Squire JP. From the start the WLR project struggled financially and, although construction started successfully, it stopped abruptly when the contractor faced financial difficulties. A further WLR Act of 1875 authorised the raising of a further £187,500 and granted an extension of time for the line’s completion. A new contractor, Barnes & Squire, was appointed, and work resumed. Southport Ash Street came into being when the line was extended westwards to the WLR’s permanent terminus at Southport Central which was first used on 5 September 1882. Ash Street’s origins went back a little further. There had been a temporary WLR terminus at Southport Windsor Road which opened in 1878. Windsor Road was just to the west of Ash Street. So that the line could be extended to Central it had to be remodelled, but passenger train services still had to operate. The solution was to alter the original station by orientating it towards the Ash Street bridge (which became known locally as the St Lukes Road Bridge), which had opened in 1880. The entrance to the remodelled station was from Ash Street, not from Windsor Road. The ‘new’ Ash Street station came into use in late July 1882. Regular through services began on 16 September 1882 and from that date the name Ash Street was applied to the station. Ash Street station had two platforms, but three lines ran through it. The centre road was used by trains that did not call at the station. It had a booking office on Ash Street, and steps led down to the Southport Central direction ‘up’ platform; a footbridge gave access to the Preston platform. Simple waiting facilities were provided on both platforms. With the introduction of the full service on 16 September 1882 passengers using Ash Street would have been able to travel to Preston WLR Station and to Southport Central. It is unlikely that many journeys would have been made from Ash Street to Central as the distance between the stations was not very great and could be walked in only a few minutes. From 16 April 1883 passengers could also travel to Blackburn. 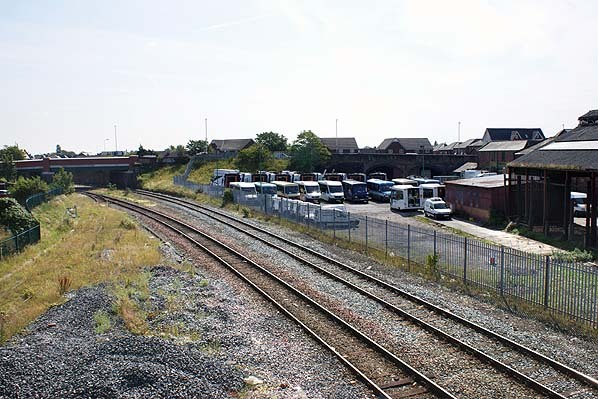 On 2 September 1887 the Liverpool, Southport & Preston Junction Railway (LSPJR), whose promotion had involved the WLR, opened its line from Hillhouse Junction (on the CLC Aintree to Southport Lord Street line) to two junctions with the WLR line at Meols Cop. Regular passenger services were introduced between Southport Central and Altcar & Hillhouse on 1 November 1887, and these would have served Ash Street. By this time the WLR had involved itself in a number of abortive expansion schemes which made the company hopelessly insolvent. On 1 July 1897 the WLR and the LSPJR were absorbed into the Lancashire & Yorkshire Railway (LYR). The LYR had a terminus at Southport Chapel Street as well as St Lukes station, close to Ash Street, on their Southport and Wigan line. The LYR were reluctant to operate a separate terminus at Southport so they obtained an Act on 1 July 1898 granting them powers to make alterations which would enable them to operate services over the former WLR line into Chapel Street. The closest point where the former WLR approached Southport and Wigan line was at Southport Ash Street. Demolition of the station was necessary to allow a junction between the lines to be completed. The LYR took the opportunity to rebuild its St Lukes station so that it had a platform on the former WLR line. For a short period a temporary platform for Ash Street was opened on the east side of the Ash Street bridge. It opened as a single platform on the weekend of 23 March 1901; this allowed the station to be demolished and the junction to be installed. Passenger trains began operating over the junction on 1 May 1901, and Southport Central was closed. The temporary platform at Ash Street was closed by 5 February 1902. Nothing survived of the station in 2011, but one rusting track marked part of its site. 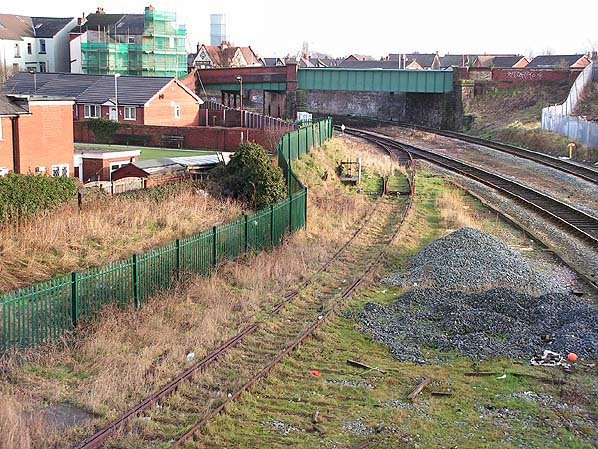 The lines between Southport Chapel Street and Wigan, via Meols Cop, pass through the site of its former ‘up’ platform. Looking east from the Windsor Road footbridge towards St Lukes station in October 1953. The LMS-built EMU of 1938 vintage is adjacent to the site of Southport Ash Street station which would have been to the left of the train. 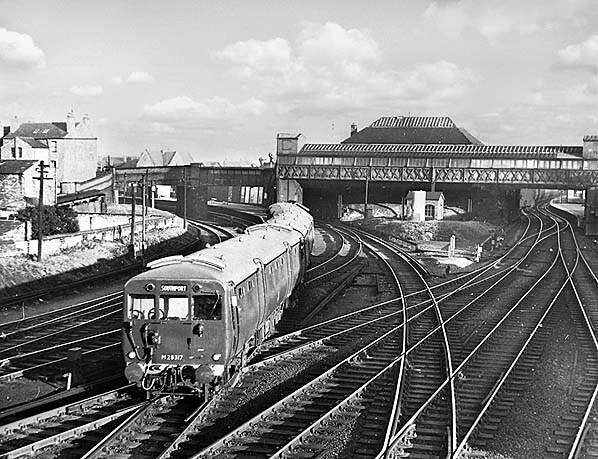 The EMU is working a Southport Chapel Street to Crossens service, and is approaching the Preston line platform at St Lukes Station, which can be seen under the bridge on the left. To the right of the picture the Wigan line platform at St Lukes can be seen. 1890 1:500 OS town plan. Before St. Lukes station opened on the Preston line the L & Y had its own station at Ash Street, shown here on an 1894 1:2,500 OS map. 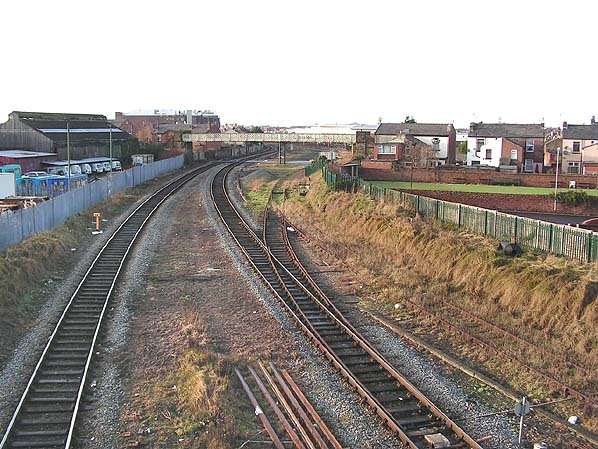 Looking west towards the site of Southport Ash Street station in January 2006. The rusty track on the right of the picture marks the approximate position of the station. The lines veering to the left mark the position of the 1901 connection to the Chapel Street (Southport - Wigan) line. 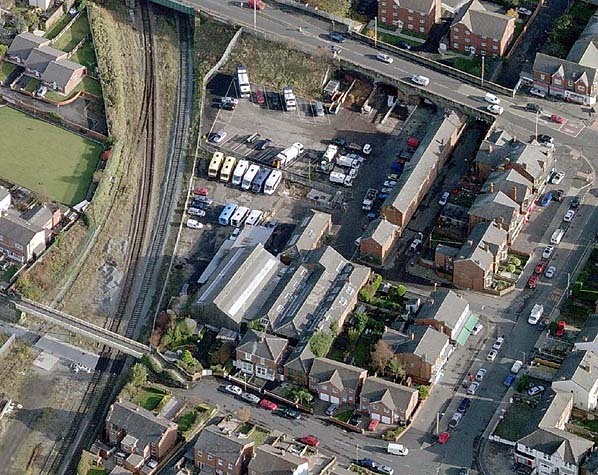 Mid 2000's aerial view showing the site of Ash Street station between the foot bridge and the road bridge. Looking east at the site of Southport Ash Street station in July 2011. The station stretched from the bridge in the background to the point where the pile of ballast is in the left foreground. The overgrown line to the left roughly follows the route of the line to Southport Central that would have served the ‘up'’ direction platform. The area of land to the right of the bridge in the distance under which the line passes marks the site of Ash Street station’s booking office.